November 4, 2013 November 4, 2013 Nefer Khepri, Ph. D.
Well, another day, another weird experience for me! Yesterday we went to church. It’s nondenominational Christian, and during the service I saw this huge self-illuminating bluish-whitish orb!!! It was slowly traveling from left to right across the front of the stage. This church has a band every week so it’s one of those modern Christian churches, songs are very uplifting & have a good beat, you can even dance to most of them. Well, this orb was DANCING! It was making tiny jumps up & down in time to the music dancing along the front of the stage, then it would dance on back to the left side, then repeat. I saw this with my NAKED EYES. Never have I seen an orb with my own eyes, but have caught some with my camera, including the awesome orb I caught at the Stanley Hotel last August that has tiny faces throughout. 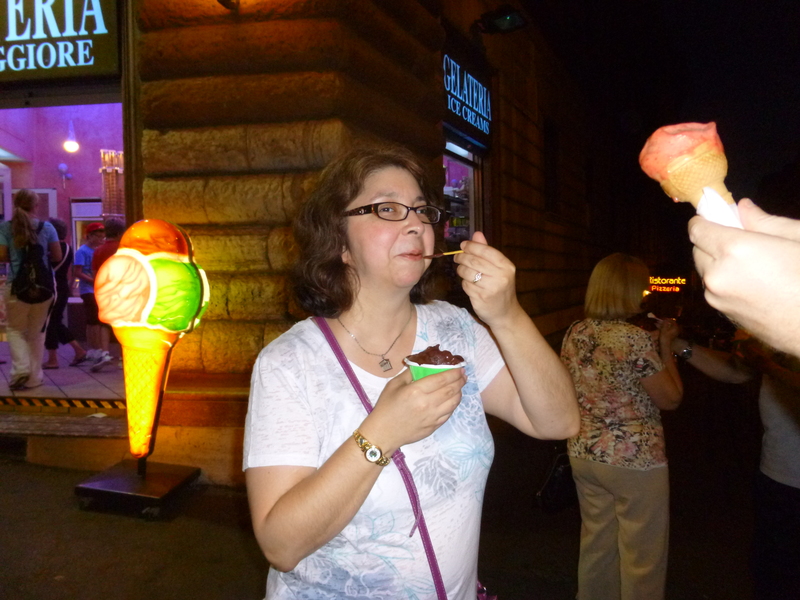 Unflattering picture 1 of me eating gelato. That’s my husband’s hand to the right. Behind me is my mother-in-law with her back to us. Note my left elbow. Nothing is there for the first picture. Here is an example of an orb that showed up in picture my daughter took of me June 26, 2012 when we were in Rome. This was also the day I received the total healing of my 39 chronic knee problem from the Virgin Mary in Her basilica, which is actually about 2 blocks away from this gelato place that was down the street from our hotel. 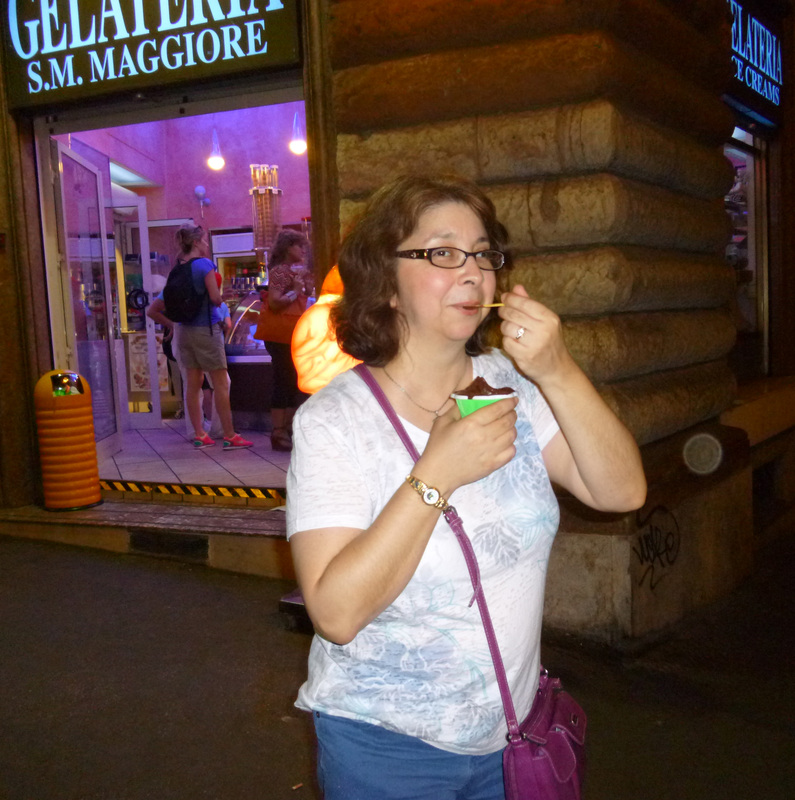 Note my left elbow & the fact that in this first picture there is nothing there, just me enjoying fudge gelato. BTW, the owner on the 2nd night had won Best Gelato in Rome & came while we were there with his huge trophy and did a dance, so little did we know we were eating the best. All I knew was that it was to die for. Taken less than 10 seconds later, now you see an orb at my left elbow. it was some fresh Italian man trying to pick me up! LOL). You can see the orb right at my left elbow. No one ever saw it with their naked eyes & I didn’t feel anything. I have no way of knowing if that was someone attached to me, perhaps healing energy from the Virgin Mary still working on my knees or even an angel She has sent to me to complete the healing (my knees were instantly completely healed & you can read about that here), or some local spirit who wanted to do a photo bomb. It’s an interesting example of how orbs can suddenly show up from one picture to the next. When we left church my 15 year old daughter immediately says, “Wow! Church was full of orbs today & one zoomed past my head & nearly hit me!” She said there were TONS of orbs, that they were all over the place & many around the pastor to the point that at times she could barely see him through all the orbs!! Now, the interesting thing is this: the pastor was talking about Apostolic Cessationism, which is the belief that the spiritual gifts of speaking in tongues, healings, & prophecy given to the Apostles were only meant to start up the Christian Church, then once started up & the Apostles died off, those spiritual gifts died with them. Some churches believe this while others believe to this day certain people have these God-given gifts & so those churches encourage their practice (like the Pentacostal church who is well known for speaking in tongues). He then said belief & practice of such things is a non-something issue, it’s not something that the church feels would keep you out of heaven, one way or another. He then said that our branch of the church believes these gifts exist, believe people can still do this, but they don’t overtly practice it in the common Sunday assembly of members. But he said there are quite a few members who can speak in tongues, heal, & prophecize. He also said as long as such things are done with LOVE, and with the intention of edifying (building up, encouraging, helping) others, then it’s FINE to do such things & to appreciate such gifts. He concluded by saying THERE IS NOTHING WRONG about practicing such gifts & that even the gift of prophecy can be a great blessing to have hints of what is coming up ahead in a person’s life. SO! All that being said, I think all those orbs were people’s angels & spirit guides who were attending & hearing the message this morning. I think they were really happy to hear such a message being given out to so many at once (our church is huge with 3 Sunday services that all average around 600 – 1,000 people per service). Not sure who the dancing bluish-whitish orb was, but it was huge, about a foot in diameter from my view & we were seated halfway back, so I’d estimate if I were right in front of it that it would have been 18 – 20″ in diameter. Just had to share! I was SUPER EXCITED to see that orb, but didn’t see the “tons” my daughter said she saw. As usual, my husband saw nothing & thinks we both need to get our eyes checked! Wishing you all Many Blessings! Nefer Khepri, PhD., R. M-T. Previous Bluestar, My Magickal Cat.